It’s no secret that you can enjoy various things within your Yogyakarta tour package. Presenting a range of destinations to visit and limitless things to do, Yogyakarta is for sure a paradise for everyone to spend their vacation. But, instead of visiting those cool temples and those amazing beaches, you can opt for witnessing a unique cultural attraction offered in Yogyakarta. When it comes to cultural attraction that you can enjoy on your Yogyakarta tour package, we shouldn’t forget about Rebo Pungkasan Tradition. This is one of the unique traditional ceremonies which is held once in a year in Yogyakarta particularly in Wonokromo Village, Plered, Bantul. This tradition always becomes an awaited event and also an object that attracts many tourists. For sure, this tradition is not always available on Yogyakarta tour package since it is only held once each year. You can only watch this tradition on Tuesday or Wednesday night in the last week of Sapar Month, a Javanese month based on lunar calendar. This is the reason why the tradition called Rebo Pungkasan which means the last Wednesday. Despite the history behind the tradition of Rebo Pungkasan, nowadays this tradition is wrapped up in far more interesting touch to be worth a check on your Yogyakarta tour package. It becomes more like a cultural attraction that can be enjoyed by tourists and locals. And here are some of the highlights on the Rebo Pungkasan Tradition. Lemper is a traditional food made of glutinous rice filled with shredded chicken. On the Kirab Lemper Raksasa, you won’t witness the usual lemper. Instead, you will see a giant lemper which is brought for a parade from Wonokromo Mosque to the Wonokromo Village Hall. It is for sure an amazing experience within your Yogyakarta tour package. Moreover, the Rebo Pungkasan tradition is also characterized with a night market which becomes a magnet for locals and tourists to spend their nights. As you can expect for a night market, there might be a food bazaar and a presentation of locals’ products. You can use this opportunity during the Yogyakarta tour package you take to get something for souvenirs. You can also expect for some local art groups performing unique art performance during the ceremony of Rebo Pungkasan tradition. The performances include kubrosiswo, salawatan rodat and many others. 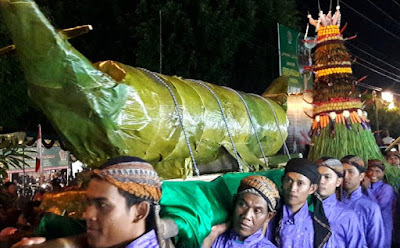 As you enjoy the art performances, you can observe the giang lemper is cut and distributed to every participant who joins the ceremony within their Yogyakarta tour package. That’s all a few highlights that characterize the Rebo Pungkasan tradition in Yogyakarta. For you who are thrilled to experience this tradition by yourself, discuss your interest with the right local tour agent like www.jogjabromotour.com. Here, you won’t only find the best package for your tour but also the best partner to get the most of your Yogyakarta tour package.